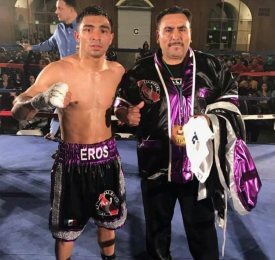 SAN JOSE, CA (March 25, 2019) - This past Saturday at the San Mateo Event Center, Cali Boxing Management's super bantamweight prospect, Eros Correa (7-0, 6 KOs), remained undefeated with a unanimous decision victory over Zakaria Miri (0-2). Correa goes the distance for the first time in his career, ending his six-fight knockout streak. The fight was promoted by Ambition Empire Promotions.